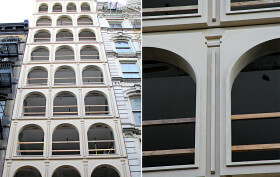 After a unanimously approval by the Landmarks Preservation Commission in June 2011, the Morris Adjmi-designed condo building at 83 Walker Street has fully risen and is nearly completely adorned with its creamy, concrete facade. The nine-story, 19,000-square-foot building is being developed by Brooklyn-based Abra Construction Corp. and will house a duplex unit at the ground and cellar levels and eight full-floor residences above. Its narrow 24-foot-wide lot is within the fast-changing eastern extents of Tribeca (formerly Chinatown) and sits within the Tribeca East Historic District. The realized project is slightly higher than zoning allows and had to seek approval from the City Planning Commission in addition to the LPC.